Our robot was a scissor-jack that lifted two-foot diameter floppies filled with packing peanuts eight feet in the air. The Steel Falcon had a strong gripper that grabbed the puck efficiently. It also had a strong quarter-inch steel bottom base plate. We were one for the few teams that had a wood scissor-jack, which lead to some interesting advantages. Because it was our first year, and our first robot, the entire season was our favorite memory. 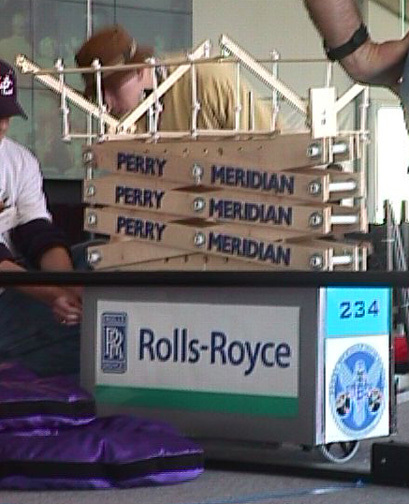 Since this was our rookie year, our greatest accomplishment was actually just getting the robot built and running on-time.